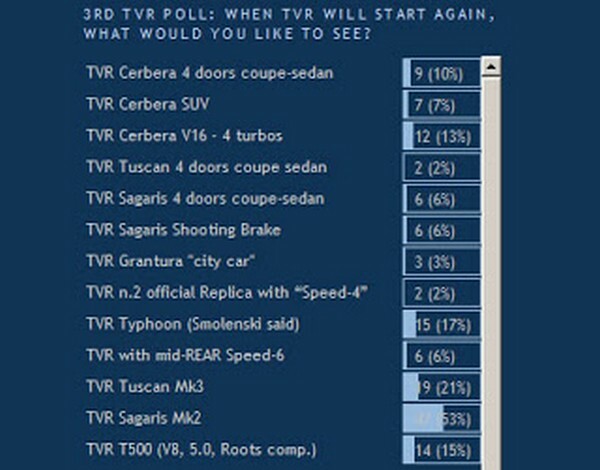 3rd TVR Poll: When TVR will start again, what do you like to see? The results? The 3rd TVR Poll it’s closed. In the last 6 months we asked you, TVR enthusiasts, what new model will you like WHEN (because we’re sure of it!) 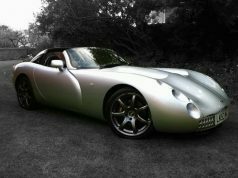 TVR will start again the production. 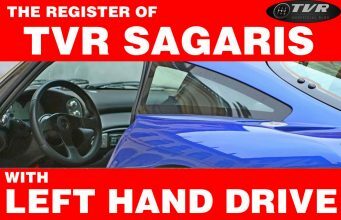 People votes for the TVR Sagaris MK2, 53%, as the most desiderable one. 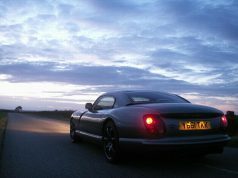 This means that TVR Sagaris MK1 has reached almost the perfection among Y2K’s TVRs for performances, design and driveability. So we could expect that a new model will be even better. 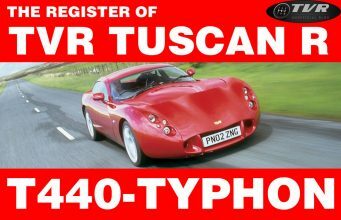 The second position is for a TVR Tuscan MK3, 21% of votes. The first model to be equipped with the Speed6 engine, and which was produced in two series has definetively consecrated TVRs as the most representative brand among the small British manufacturers. 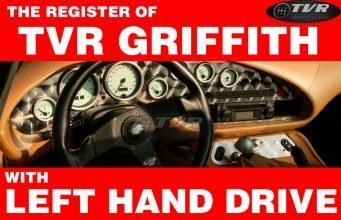 The third position, 15%, is for a new TVR Griffith we dubbed a “T500”: can you imagine a new TVR Griffith, with a new style, and with the V8 supercharged engine (500 hp) of the Jaguar XFR or XK-R? Terrific! The 4th place, 17%, is for a car that Mr. Nikolai Smolenski promised (even with some very interesting sketches) he would have introduced at Geneva 2007: the TVR Typhoon. Unfortunately this car remained a rendering but people apparently did not forget that promise (a supercharged version of a 4 litres Speed-6, 600 hp, more than 200 mph, 0-60 in less than 4″). 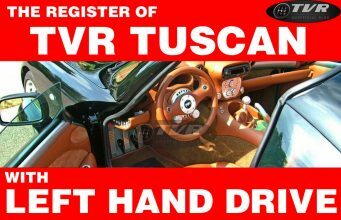 This project will be a compulsory task for the New TVR Company! The 5th significant place, 13%, is for a monster: remembering the mighty Cerbera Speed12, we’d like to imagine even a more prodigius car. Try to imagine two AJP engines with 4 turbos. 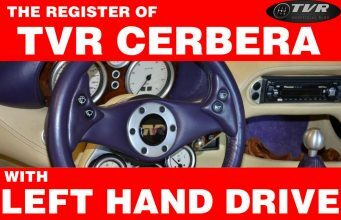 We think that none car could succeed in being better than a TVR Cerbera Speed-16T for many many years. 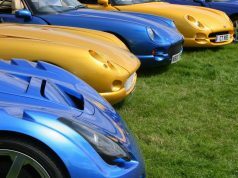 According to results TVR enthusiasts want TVR production to remain the same: before Mr. Peter Wheeler sold the company to Mr. Smolenski the factory was going as it best with Tuscans, Sagaris, T350 and Tamora. 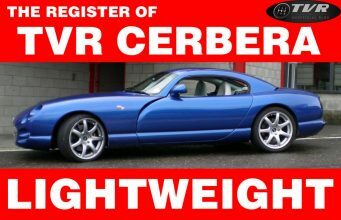 Mr. Wheeler knew exactely what a TVR customer wanted and how a TVR should be. 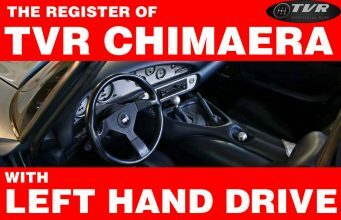 And for the future very few people would that the model range followed actual trends: a TVR Suv, a Cerbera with 4 doors (to compete with the Aston Martin Rapide or the Porsche Panamera), a TVR Sagaris Shooting Brake or a TVR Grantura City car. 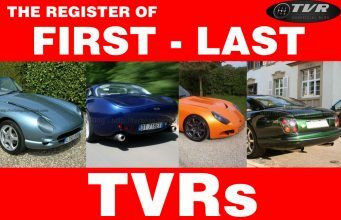 This means, simply, that at TVRs marketing rules wouldn’t work: TVR enthusiasts love a very genuine supercar, with a lot of power and incredible performances.